St. Louis County is pressing charges against two reporters who were arrested inside a McDonald's in Ferguson, Missouri last August. Wesley Lowery, a reporter for The Washington Post, confirmed to CNNMoney that he received a court summons on Monday. The summons charges Lowery with trespassing on private property -- the McDonald's -- and interfering with a police officer. And Ryan Reilly, a reporter for The Huffington Post, is being charged with the same offenses, according to his employer. "A crime was committed at the McDonald's, not by journalists, but by local police who assaulted" both reporters "during violent arrests," The Huffington Post's D.C. bureau chief Ryan Grim said in a statement Monday night. Both men were arrested on August 13. 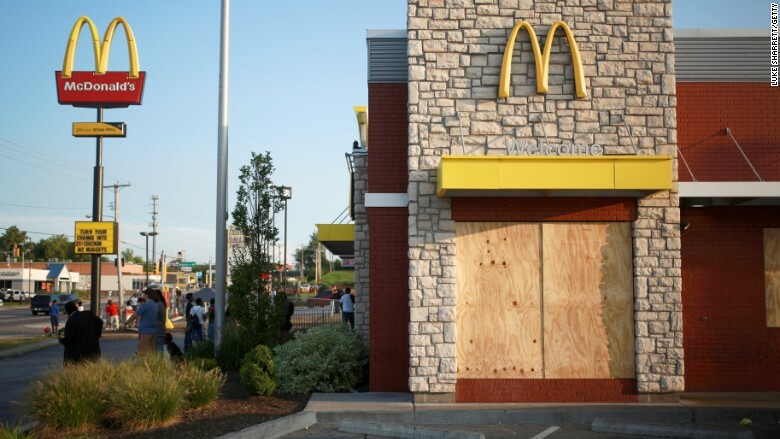 At the time, protests about the death of Michael Brown were growing in and around Ferguson and the reporters had been using the fast food restaurant as a place to organize their coverage. The court summons arrived as the city of Ferguson was roiled by fresh protests and a large number of arrests. The two men knew some sort of action was possible this month because the one-year statute of limitations was approaching. Reilly was expecting the authorities to press charges; Lowery thought it was less likely. When Lowery quipped on Twitter on Monday that "Ryan won," Reilly replied, "You owe me a Happy Meal." Jokes aside, the charges are a serious matter that were immediately criticized by journalists at both Posts and other news organizations. Marty Baron, the executive editor of The Washington Post, called the charges against Lowery "outrageous." The National Association of Black Journalists also took issue with the charges, saying they "believe it to be a direct assault on the free exercise of the First Amendment, which ensures journalists can practice their craft." Lowery said in a telephone interview, "With the lessons seemingly learned on optics and rhetoric and handling this type of unrest, I couldn't imagine that, a year later, St. Louis County would decide that charging a Washington Post reporter for doing his job would seem like a wise thing to do." He said the newspaper's legal team is "currently discussing what we're going to do and how we're going to proceed." He has an August 24 court date. Lowery emphasized that "we were not in the wrong" on the day of the arrest. Reilly called the charges "unfortunate, and a distraction from a lot of the key issues" affecting the Ferguson area. "It reveals a lot about the problems that they have," he said. "If they're charging us in this nonsense case, what are they getting away with charging other people with?"